(Phys.org) —With one stomp of his foot, Zhong Lin Wang illuminates a thousand LED bulbs – with no batteries or power cord. The current comes from essentially the same source as that tiny spark that jumps from a fingertip to a doorknob when you walk across carpet on a cold, dry day. Wang and his research team have learned to harvest this power and put it to work. A professor at the Georgia Institute of Technology, Wang is using what's technically known as the triboelectric effect to create surprising amounts of electric power by rubbing or touching two different materials together. He believes the discovery can provide a new way to power mobile devices such as sensors and smartphones by capturing the otherwise wasted mechanical energy from such sources as walking, the wind blowing, vibration, ocean waves or even cars driving by. Beyond generating power, the technology could also provide a new type of self-powered sensor, allowing detection of vibrations, motion, water leaks, explosions – or even rain falling. The research has been supported by a variety of sponsors, including the National Science Foundation; U.S. Department of Energy; MANA, part of the National Institute for Materials in Japan; Korean corporation Samsung and the Chinese Academy of Sciences. The research has been reported in journals including ACS Nano, Advanced Materials, Angewandte Chemie, Energy and Environmental Sciences, Nano Energy and Nano Letters. "We are able to deliver small amounts of portable power for today's mobile and sensor applications," said Wang, a Regents professor in Georgia Tech's School of Materials Science and Engineering. "This opens up a source of energy by harvesting power from activities of all kinds." In its simplest form, the triboelectric generator uses two sheets of dissimilar materials, one an electron donor, the other an electron acceptor. When the materials are in contact, electrons flow from one material to the other. If the sheets are then separated, one sheet holds an electrical charge isolated by the gap between them. If an electrical load is then connected to two electrodes placed at the outer edges of the two surfaces, a small current will flow to equalize the charges. By continuously repeating the process, an alternating current can be produced. In a variation of the technique, the materials – most commonly inexpensive flexible polymers – produce current if they are rubbed together before being separated. Generators producing DC current have also been built. "The fact that an electric charge can be produced through triboelectrification is well known," Wang explained. "What we have introduced is a gap separation technique that produces a voltage drop, which leads to a current flow in the external load, allowing the charge to be used. This generator can convert random mechanical energy from our environment into electric energy." Since their first publication on the research, Wang and his research team have increased the power output density of their triboelectric generator by a factor of 100,000 – reporting that a square meter of single-layer material can now produce as much as 300 watts. They have found that the volume power density reaches more than 400 kilowatts per cubic meter at an efficiency of more than 50 percent. The researchers have expanded the range of energy-gathering techniques from "power shirts" containing pockets of the generating material to shoe inserts, whistles, foot pedals, floor mats, backpacks and floats bobbing on ocean waves. They have learned to increase the power output by applying micron-scale patterns to the polymer sheets. The patterning effectively increases the contact area and thereby increases the effectiveness of the charge transfer. Wang and his team accidentally discovered the power generating potential of the triboelectric effect while working on piezoelectric generators, which use a different technology. The output from one piezoelectric device was much larger than expected, and the cause of the higher output was traced to incorrect assembly that allowed two polymer surfaces to rub together. Six months of development led to the first journal paper on the triboelectric generator in 2012. "When two materials are in physical contact, the triboelectrification occurs," said Wang, who holds the Hightower Chair in the Georgia Tech School of Materials Science and Engineering. "When they are moved apart, there is a gap distance created. To equalize the local charge, electrons have to flow. We are getting surprisingly high voltage and current flow from this. As of now, we have discovered four basic modes of triboelectric generators." Since their initial realization of the possibilities for this effect, Wang's team has expanded applications. They can now produce current from contact between water – sea water, tap water and even distilled water – and a patterned polymer surface. Their latest paper, published in the journal ACS Nano in November, described harvesting energy from the touch pad of a laptop computer. They are now using a wide range of materials, including polymers, fabrics and even papers. The materials are inexpensive, and can include such sources as recycled drink bottles. 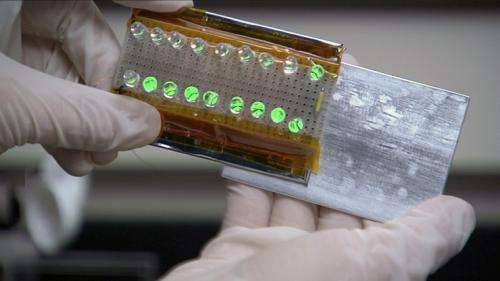 The generators can be made from nearly-transparent polymers, allowing their use in touch pads and screens. Beyond its use as a power source, Wang is also using the triboelectric effect for sensing without an external power source. Because the generators produce current when they are perturbed, they could be used to measure changes in flow rates, sudden movement, or even falling raindrops. "If a mechanical force is applied to these generators, they will produce an electrical current and voltage," he said. "We can measure that current and voltage as electrical signals to determine the extent of the mechanical agitation. Such sensors could be used for monitoring in traffic, security, environmental science, health care and infrastructure applications." For the future, Wang and his research team plan to continue studying the generators and sensors to improve their output and sensitivity. The size of the material can be scaled up, and multiple layers can boost power output. "Everybody has seen this effect, but we have been able to find practical applications for it," said Wang. "It's very simple, and there is much more we can do with this." Cool stuff, but need more info... 300 Watts for how long? A millisecond? 1/2 a second? How long until material wear/breakdown plays an important factor in the degradation of electrical production? Still cool though. So simple. This has obvious applications in vehicles. Hope they hire a good marketer to get it out of the lab and into the market. Such a nanosurface would wear off pretty quickly... A similar problem exists with various attempts for improvement of solar cells with surface nanostructures: they degrade fast just because of their large surface area. I know it's silly but the first thing I thought of when they described using this stuff was using some of it like when kids used to put playing cards on bikes with clothespins make motor noises as the spokes hit them when riding. Now it could also supply lights! Actually though this stuff has a lot of possibilities. Yet another "more efficient energy source" invented in the lab you won't hear anything practical about in the next 20 years. This is the 101th of its kind. I think that this is a good idea and that it should help to develop new energy efficient generators in the future. Thanks for sharing this information with us.